Total Gross GST revenue collected in the month of March, 2019 is Rs. 1,06,577 crore of which CGST is Rs. 20,353 crore, SGST is Rs. 27,520 crore, IGST is Rs. 50,418 crore (including Rs. 23,521 crore collected on imports) and Cess is Rs. 8,286 crore (including Rs. 891 crore collected on imports). The total number of GSTR 3B Returns filed for the month of February up to 31st March, 2019 is 75.95 lakh. The Government has settled Rs. 17,261 crore to CGST and Rs. 13,689 crore to SGST from IGST as regular settlement. Further, Rs. 20,000 crore has been settled from the balance IGST available with the Centre on provisional basis in the ratio of 50:50 between Centre and States. The total revenue earned by Central Government and the State Governments after regular and provisional settlement in the month of March, 2019 is Rs. 47,614 crore for CGST and Rs. 51,209 crore for the SGST. 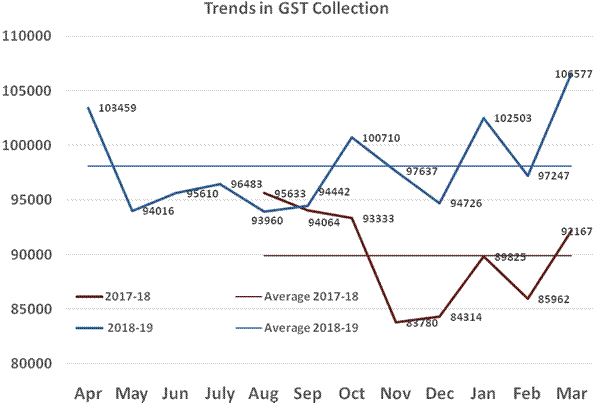 The collection during March, 2019 has been the highest since introduction of GST. The revenue in March, 2018 was Rs. 92,167 crore and the revenue during March, 2019 is a growth of 15.6% over the revenue in the same month last year. The revenue for the last quarter in the year 2018-19 is 14.3% higher than the revenue collected during the same period last year. The monthly average of GST revenue during 2018-19 is Rs. 98,114 crore which is 9.2% higher than FY 2017-18. These figures indicate that the revenue growth has been picking up in recent months, despite various rate rationalization measures. © 2019 corporate-cases.com. All rights reserved.